I’ve been drawn to the Sri Yantra on an intuitive level for some time now, but until recently it had been only stirring in the back corners of my mind. Then right after Element 11 Festival a few weeks ago, it pushed itself into the forefront of my attention and intention. In other words, it reached out and said, “Look at me! It’s time.” As I’ve learned about this specific yantra and its meaning and purpose since, I’ve discovered how relative it is to me, right now, and in my own progression toward understanding a deeper purpose and meaning. As I’ve mentioned in prior related posts, the Sri Yantra is (among so many other things) a symbol of the cosmos and the natural and supernatural forces that weave it together. It has many layers of meaning, and teachings relative to the nature of the universe, the creative forces of nature, and how consciousness comes into being and evolves. It also echoes the notion of “as above, so below,” which I believe is one of the very few axioms that could be considered a universal truth. For me, understanding the Sri Yantra represents an obvious (once seen through hindsight) first step in a journey toward individual and collective enlightenment and conscious, yet limitless awareness. Much like my other artwork, it wrestles with the place and purpose of the self among all things. But the Sri Yantra takes us well beyond, as it has long been imbued with the deep, urning questions of our species…and insight into the answers to those questions. So far, I’ve been able to achieve a high level of precision in my artwork with relative ease through the use of patterns, computers, math, and close measurement. However, even with these aids, I found it very difficult to ‘line up’ the triangles of the Sri Yantra. Even trying to fix one skewed line causes a chain reaction of adjustments that affects several other triangles at a minimum, but can ripple through the entire structure in a never ending tweak loop. Finding that balance does not come easy. Getting it perfect seems to be impossible. I even paid for a supposed “super high resolution vector image” of the triangles, which still had several concurrency errors. This is among the many things about this yantra form that simply amazes me. Generally, computers (and 10¹¹ calculations—that’s 100 billion!) are needed to achieve the high degree of precision necessary to accurately portray this 6,000 year old symbol. It reflects a very sophisticated understanding of geometry, mathematics, numerology, and physics. I’m skeptical that someone simply stumbled upon creating this yantra in its precise, yet robust form in a single moment in time—or even a single lifetime for that matter. And this realization leaves me pondering…where did this Sri Yantra thing come from?? In the end, I’m stuck knowing that my utmost efforts to achieve precision were bested by the likes of 27 straight lines (incidentally, that’s 3 x 3 x 3, or 3 cubed, or the number of creation scaled into three dimensions…). In other words, my version of the Sri Yantra has some known error. Hardest of all to achieve was precision in concurrency, which requires that all the triple intersection points (37 in all) meet at the same point rather than crisscrossing. I have found that getting this to a degree of accuracy of a single line width is beyond me. So I’ve fudged in a couple of places. Hopefully, they’re not too apparent. Concentricity is slightly off too, but I think I did a pretty good job of keeping the entire thing symmetrical and concentric. See if you can find the imperfections. It is easy to recognize my references to the classical portrayal of the Sri Yantra. My representation is very typical in its structure and proportion, with the nine triangles—five downward, four upward—surrounded by rings of eight and 16 lotus pedals. The square, outer-most enclosure of the Sri Yantra is called the bhupura, and is also traditional in form (and a feature seen in most of the dozens of yantras for that matter). These typical elements are what make the Sri Yantra what it is, and enable its energetic frequency. Parts of the yantra are sometimes carved out and shown separately—the central form (i.e. nine triangles) for instance. However, I think portraying the entire yantra is required to have access to the full spectrum of wisdom being offered. Therefore, I felt it necessary to maintain these important references to ensure integrity to the very nature of the Sri Yantra. However, there are elements of my version that I haven’t seen elsewhere. For instance, the array of concentric rings of gold tiles came to me in a visionary moment…an ecstatic daydream of sorts. But the vision immediately sank an impression into my awareness that what I had beheld was what I should put behind the central form. As it sits behind the triangles of the central form, the rings seem to slide upon each other, making my eyes think the rings are in motion. In addition, the concentric rings create the illusion that some of the lines in the triangles are not straight (check them yourself…they’re all straight), but look curved like the spherical or kurma form of the Sri Yantra. This is simply a subtle optical illusion, but allows the viewer to resonate (or shift attention) between the image’s planar and spherical perspectives. This was a surprise and delight to discover, literally as I was penciling in the triangles of central form and seeing it for the first time. In addition, I think the 13 concentric rings reverberate the sonic nature of this yantra, and visually suggest the physical cone or rippling properties of sound waves moving through space and matter from a center point. From this, I simply shaded the rings of triangles out of the central form to create the illusion of a pyramidal or meru Sri Yantra. So while my portrayal of the Sri Yantra is in fact a planar form representation, it enables the simultaneous view or perspective of all three dimensional representations. I stumbled across this through my process, and wouldn’t take credit for anything novel, but wow if it doesn’t just blow my mind…!! When I think of all creation, I often think of the classical model of the four elements—Air, Fire, Water, and Earth. The concept of the four elements is referenced in many mythologies, alchemy, and has also been cross referenced or correlated to the four directions—East, South, West, and North. In my opinion, the four elements or the four directions are one of the simplest ways to understand and model the physical world. So, beyond the central form and the lotus flower lies the realm of the four elements or the four directions represented by the colors yellow, red, blue, and green. In many native American traditions, the colors red, yellow, black, and white are used for the same concept. The bhupura, or “earth stretch” represents the the boundaries of the physical world, and also the physical body itself, with its passions and instincts. Ancient wisdom suggests humans have eight psychological tendencies or instincts, which are considered obstacles of consciousness and are generally what we experience through senses-based activities and indulging the cravings of our egotism. They include, worldly desire, anger, constant avarice and greed, fascination and infatuation, false pride, jealousy, earthly rewards, deficiencies, and blameworthiness; and specific sections of the bhupura correspond to each. In addition, in the corners of the bhupura I have included references to the I Ching, which represents the world through eight elements: Earth, Mountain, Water, Wind, Thunder, Fire, Lake, and Heaven. The I Ching patterns surround centuries-old Western alchemical symbols for the four classical elements mentioned above. I also like the I Ching because it correlates so well with the structure of human DNA—the language used to create our form of life—with the 64 base DNA pairs corresponding to the 64 hexagrams of the I Ching. Is this coincidental? Many think not. In fact, efforts are underway to actually map the I Ching to our DNA and use it to decipher inactive DNA as a language or message (Sources: World_Mystery.com, Terrence McKenna (The Invisible Landscape, 1994), Meme Storage in DNA). The I Ching is a system thousands of years old (perhaps the oldest known today) used for passing important information from one person to another person. DNA is very much the same thing. As our understanding of DNA as emerged over the past 60 years, many have begun to recognize that there is much more in the code that what Watson and Crick first deduced, and the purpose of much of our latent DNA (the majority) has yet to be understood. An additional reference to DNA is seen in the Shipibo-Conibo style patterning in the bhupura, which I adapted from patterns representing ancient sacred songs passed down from their distant ancestors. Many notice an uncanny resemblance of the the intricate Peano curve patterns of this unique ancestral art form to the space filling curves derived by mathematicians to model how DNA coils together in space. So combined, the colors, codes, and patterns I’ve placed in the bhupura represent universal creation, the physical the world around us including time and space, and the natural being (i.e. the clay body) we inhabit during our earthly existence. Many times, when I look at nature, the stars, or plants and animals, I see patterns. At first glance, these patterns seem highly complex. However, upon inspection, most of these patterns can be reduced to a simple ratios like Phi (the Golden Mean) or Pi, or a definable sequences like the Fibonacci Sequence. When I recognize these patterns, it is as if I can actually see the fabric of creation—it’s like looking at a painting and discerning exactly how the artist created it. As such, patterns in ripples or clouds, stars that seem to follow geometric lines, harmonious musical notes, or the spiral shape of a snail shell or a sprouting fern leaf all seem random until you look closely—once perceived as order, the patterns are easy to identify. With the bhupura representing boundaries of the physical realms, I wanted to place the Sri Yantra in the context of a sea of infinite possibility, of ultimate potential, and limitless material availability. I chose to represent this concept with a field of stars woven into concentric rings and interconnected ribbons that expand and interrelate infinitely. This creates both straight and curved ribbons of stars one can follow infinitely. These ribbons transect in a flower of life type of geometric symmetry, creating a web or cosmic framework related in all directions (think six directions). This arrangement in the universe is what creates our perception of time and space, much like the ribbons of stars do in the space behind the Sri Yantra. The ribbons also depict a physical flow of energy and matter that would act as the tarn of material, intelligence, and creativity from which all things spring forth. Ever changing and expanding. Ever recirculating and renewing. Endless, infinite, and boundless. And as empty as it is full. For those without knowledge of the cosmic framework, randomness, superstition, and resignation to fate seem to be the context of reality. For those with the perspective, the patterns of reality are elegantly evident and recognized as order. Ancient references to time as a wheel, like with the Mayan calendar and the I Ching, point to prior awareness such patterns which are now obscured from our modern perspective. As an exercise to understand this point, try to find the pattern in the concentric gold rings behind the central form. I used a repeating pattern to create it. Granted, the pattern is somewhat complex—in fact, I intentionally made it difficult to recognize the pattern. But it is there. If you look enough, you’ll see that those 1,500 or so gold tiles follow a pattern that is repeated merely eight or ten times. But because the pattern is more complex than the viewer’s assumptions or their ability to take it all in and understand it as order, it appears to be random, or at least too complex to model accurately. In many ways, the Sri Yantra represents the journey of consciousness, and there are two traditional ways one journeys through the Sri Yantra during meditation. If one starts from the outer-most enclosure, the bhupura, and moves inward until reaching the dimensionless bindu point, the movement suggests progressive implication and a contracting of the dimensions, leading to dissolution in the point. It is described as the “way of enfoldment” (samhriti). If, on the other hand, one begins with the bindu and moves outward until the all-enclosing bhupura is reached, this movement suggests progressive explication and dimensional expansion. It is described as the “way of unfoldment” (srshti). In either case, there are nine enclosures or boundaries through which the sojourner passes. Just as the bhupura represents specific physical passions or instincts, all nine enclosures have characteristic forms, names, meanings, symbolism and each corresponds with aspects of nature and human constitution (Source: Yantra, by Madhu Khanna). So as one moves from one level to the next, progressive evolution through particular human characteristics and forms is achieved. Each step represents an advancement toward either complete enfoldment or unfoldment. In all, nearly 80 aspects of the human condition are represented, and therefore encountered in the journey. Not only is the journey of consciousness mapped out in the Sri Yantra, but you’re even given the vehicle in which to undertake the journey. Ancient and modern references to a vehicle of light or a chariot of the soul, mention the merkaba (Hebrew מרכבה, meaning “chariot”) as the form of this vehicle, which is capable of carrying the human soul through space and time. Generally, the merkaba is portrayed as a stellated octahedron, or two tetrahedra. By simply focusing on the two largest triangles of the central form (i.e. the largest downward or feminine and the largest upward or masculine triangles) one can create a merkaba. Masculine and feminine joining together to create the physical chariot for a separate conscious soul is a beautiful analogy. At the very center of the chariot is the bindu, aka the driver’s seat! I really appreciate how elegantly this form not only lays out the journey, it gives you the keys to the car! 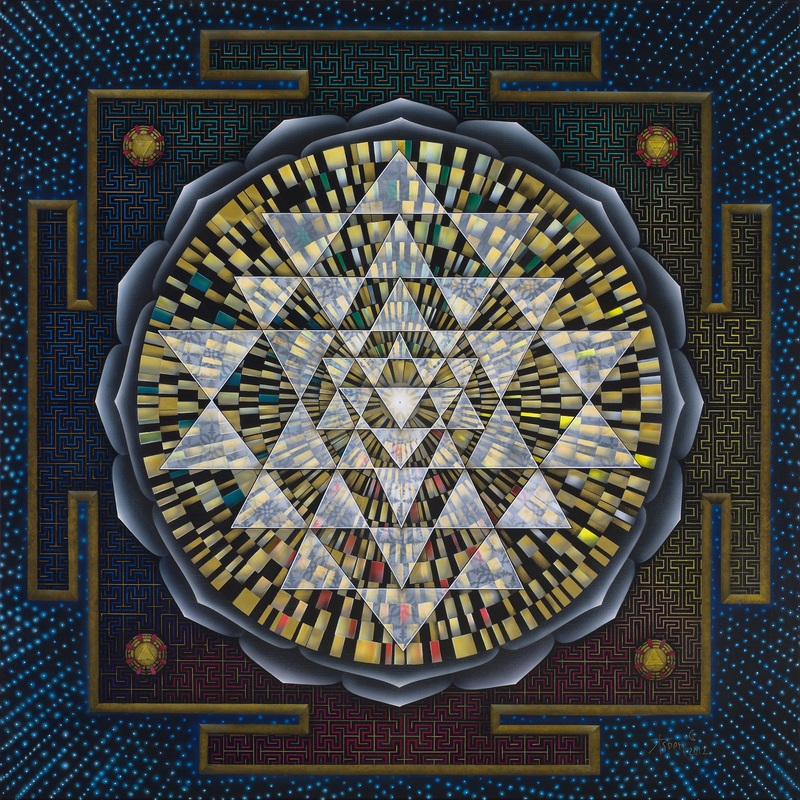 The Nature of Being—After much contemplation, I’ve come to understand that the Sri Yantra is not only a representation of the divine creative force, it represents aspects of ourselves as divinely creative beings as well. This correlation came to my understanding as soon as I likened the bindu point to the physical body (or even more specifically the pineal gland) as the point where physical form and divine consciousness bridge together. Each of us is a bindu, or a portal between the spiritual and the three-dimensional cosmos. And each of us is the divinity represented within the Sri Yantra. The importance of the bindu within the Sri Yantra cannot be overstated. It is, after all, at the geometric center of the form and the focal point of meditation. The bindu represents all manifest creation and all that is yet to be conceptualized, constructed, and manifested (i.e. infinite potential). And as such, the bindu is the purpose (i.e. the point) of the Sri Yantra itself. It represents the unique place in the cosmos where one finds the intersection between the physical plane and the creative intelligence outside of it, encompassing it, and possibly responsible for it. One of our plaguing questions as humans is “where is that sacred intersection between us and our creator?” Some think it’s a planet at center of the Milky Way. Some think it’s inside a consecrated building or in a sacred forest. And some even think it’s in the center of our skulls. There are two other ways in which I can relate the bindu point to our own physical beings. First, our capacity to reproduce and bring other conscious beings into the physical form that we are given, and then pass on. This can be seen on a couple levels if you accept that the becoming of consciousness is a gradual process, not one that happens in an instant. As such, whether in the literal passing of DNA to offspring, or in cultivating and enculturation of a being to an age of self sufficiency through years of teaching, nurturing, and sacrifice, we use our conscious, physical bodies to enable the becoming of other consciousnesses. In the most literal sense we increase the material novelty within our species (and the spirit quality it embodies) by nurturing the next generation. The second way in which we are like the portal between the physical and non-physical is through our spoken language and the opening of the throat chakra. Coming full circle, more than anything the Sri Yantra reminds me of sound. In my Sri Yantra Explored blog, I mentioned the study of cymatics, which is the study of visible sound and vibration. From this study, we have learned that various frequencies affect matter differently. By merely changing the frequency of sound that is vibrating sand on a metal plate, the tiny particles will align and order themselves along specific geometric vectors. When suspended in a liquid medium, particles create intricate three-dimensional patterns which mimic nature. It almost looks intelligent! Combining multiple frequencies and particles of various masses creates complex, almost cell–like patterns, with rigid structure mingled with channels of flow much like vascular systems. It’s pretty amazing to see. It isn’t that much different than how wind or water can shape sand or stone. But it gets better… Because sound isn’t merely frequency and amplitude. We can add content to the “monkey mouth noises” and give them agreed upon meaning. With spoken language we have the ability to create universes of understanding. With sound encoded, it becomes a powerful tool to convey an idea from one conscious being to another—through the material plane. Once spoken, ideas can even transcend epochs of time and space, independent of the creator and forever a part of the fabric of reality. For example, the words of a Greek philosopher or a Jewish carpenter can be understood, assimilated, and shape reality more than two millenia after they were uttered. Spoken language, which is something we take for granted and almost forget about because it’s so obvious, is our most powerful tool for creation. There are also well known studies which show that words can have power over physical matter. Masaru Emoto’s very famous Messages from Water research has convinced many of the power of words like love, gratitude, and hate. Mythologies and religious texts often mention the power of the word as the power used to create the universe. Om is the sound that created the cosmos. Those that practice occult arts, earth magics, and Kabala mysticism assert the power of words in the form of incantations and songs that are believed to affect the material plane (and beyond). Same thing goes on deep in the jungles of the Amazon. Christians are taught to pray (vocalize) for what they desire. Chanting and singing to Krishna is the highest form of veneration. From a comparative perspective, one might notice a strong correlation of creative vocalization between many folk and faith based practices and beliefs. Then we have science, which offers complicated and implausible theories about why the universe stays clung together instead of blowing apart and cooling according to their own “universal laws of thermodynamics,” which strangely seem to contradict observation. I’m not dissing science, which I think is useful and relevant. But in this regard, scientists are as clueless as the rest of us. My gut feeling is that there is a resonate frequency—a sound—which flows through the entire cosmos and holds it together (7.82 Hz and recently climbing…). In other words, sound (maybe even a song if you want to imbue intelligence to it) is what holds matter—you, me, the buildings, the planet, the universe—together. At this point, I could write pages about the Throat Chakra…but I’ll leave that for another day (and maybe another artwork). I wanted to bring up a couple other important ideas around the power of your voice and your words. Think about how hard is it to “take back” something you said. Once created, always created. Even if you didn’t mean to, it’s there! On the flip side of that, how much did words affect you as you were being teased as a kid or in a unhealthy relationship? Did you really believe or become what they were saying about you? How much energy does it take to recover from negative or harmful constructs? Another point is that most of the problems of human condition are problems because of our inability to talk about them. Lack of words to describe something makes us blind to it, unaware, not concerned. With with deeper understanding of concepts we see a direct proliferation of words to describe them. When we make words or ideas or concepts taboo, we essentially shunt human understanding in that realm. When we talk about things, our language grows right along with our understanding and ability to create, manipulate, and destroy. More than that, the realities of our imagination very quickly become the realities of our acutalization. I just want to thank you for your writings. They help me to understand my experience. Are we in a kind of gyroscope balancing the enfoldment and unfoldment concurrently or are they different paths to the same end? Also, in setting the intention and direction of the sojourn, how do the colors direct us? As I am coming to understand, the Sri Yantra is a tool for personal development–specifically to understand and creative power or force. I’m also finding these tools (yantras) are really quite advanced technology and adapt to the user very well. So I’d suggest starting where it feels comfortable and right with you. Even more, start wherever you are right now. Then let the enfolding and unfolding happen naturally from there, as you take each step, you’ll gain understanding and learning that you will guide you to the next logical place in the progression. As far as the colors, I don’t think they direct us as much as they color the journey and allowing reference to actual and material things worth contemplating. I will say that when I work within similar systems, I often start in the east, which is the 3 o’clock position. This is the place where I fall instinctively I think, because I’m an air sign. Then I move clockwise or counter-clockwise, depending on the intention. But that could change any time I’m coming from another perspective or emotion. Hope that makes sense.